The SR9 was introduced at the start of what I'll call Ruger's "modern era," when the company began introducing smaller, streamlined pistols specifically designed for self-defense. Compared to the P85 and P90, the SR9 has the curves of a Ferrari (but, unlike a Ferrari, was always very affordable). This is a slim gun, especially when compared to the other full-size semiautos Ruger was making at the time. Heck, the KP90 Arnold Schwarzenegger was carrying in "True Lies" looked chunky in his hand. Current suggested retail price on the SR9 is just $529, which means you can find it on the street for $475 or less. However, Ruger saw a way to give customers even more bang for their buck, so now we have the brand new Ruger 9E. From the photos, the 9E looks like an SR9, and that's because except for a few minor changes it is an SR9. Admittedly, the differences are hard to spot unless you hold the two pistols up side by side, but those differences- which are cosmetic and do not affect accuracy, reliability or function- are enough for Ruger to be able to price the 9E $100 cheaper than the SR9. You can consider the 9E the base-model SR9, but the E does not stand for "economy"; it stands for "essential." As in, the 9E gives you everything you need and nothing you don't. Ironically, I prefer the 9E to the original SR9. The SR9 and the 9E are full-size duty guns that hold 17+1 rounds of 9mm. The barrel is 4.14 inches long, and the pistol measures 7.5 inches in overall length. Empty weight of the 9E is 27.2 ounces, about 0.75 ounce heavier than the SR9. Between its size and weight, it is equivalent in size to the Smith & Wesson M&P and is a gun meant for a holster, not a pocket. SR9s are available with either stainless steel or black alloy slides, but the 9E is available only with a black alloy slide. That's fine with me, as I prefer the look of an all-black gun. The slide is where you'll see one of the main differences between the SR9 and the 9E: "9E" is laser etched attractively on the left front of the slide, with the Ruger logo on the right front. The top of the SR9's slide is rounded; the 9E's slide has a flat top plus two angled flats on either side of the top surface. The flats are easier to machine and polish (apparently the rounded top of the SR9 actually needed some hand polishing), but the extra metal adds a little bit of weight to the gun when compared to the SR9. I like the look of the angled flats more than I do a round-top slide, and despite the change in the slide configuration, the 9E will fit all holsters designed for the SR9 and accept the same accessories. The slide serrations are also different. The SR9 has narrow, flat-bottomed serrations- 11 of them on each side of the slide. The 9E has very wide serrations, and five of them take up the same amount of real estate. I found they were more than aggressive enough and again preferred them to the original ones on the SR9. The finish on the slide is black oxide (i.e., bluing), which is somewhat corrosion resistant but not as expensive to apply as the black nitride finish on the SR9. At first glance the sights look the same, but the sights and their location on the slide have been changed. The original rear sight on the SR9 was adjustable and mounted a bit forward from the rear of the slide, minimizing sight radius. This never made sense to me because a handgun is hard enough to shoot accurately, so a manufacturer should do anything it can to maximize sight radius. The rear sight on the 9E is different. It's a Novak-style, no-snag, two-dot design, and it is not adjustable- only driftable in its dovetail for windage. It is mounted farther back on the slide, with the rear of the sight even with the rear of the slide. It matches the profile of the slide, which I think looks a lot better. The front sight is a post dovetailed into the slide and has a white dot as well. However, it is not the same front sight as used on the SR9, and it's mounted a little farther forward; the front of the front sight is even with the end of the slide. Both front and rear sights are steel and provide a good sight picture. The 9E has an integral barrel ramp. Sharp-eyed readers will note there is no loaded-chamber indicator in the top of the slide. Instead, there is a "viewing port" in the barrel hood- the slot in the barrel where the SR9's loaded chamber lever is located. This change helps keep the cost down, and I assumed that this change was why the pistol is not legal for sale in California- a huge market for Ruger and every other gun manufacturer. I asked Brandon Trevino, Ruger's pistol product manager, about this, and it turns out the loaded-chamber indicator isn't the issue. "The 9E has a lower cost loaded-chamber viewport in place of the tactile loaded-chamber indicator on the SR9," he said. "The viewport is sufficient outside of California. But under current law, no manufacturer may submit any new model of semiauto handgun to the state of California unless it meets California's new microstamping requirement. Until that is overturned, California has a de facto ban on any new handgun introductions regardless of any other safety features." So there you have it. While the 9E lacks the indicator found on the SR9, it shares the SR's four safeties: manual (thumb), magazine disconnect, internal striker and the safety lever on the trigger. The 9E is chambered only in 9mm and comes with one 17-round magazine made in Italy by Mec-Gar, which has an enviable reputation for quality magazines. The 9E takes the same magazine as the SR9- they are internally identical- so magazines are widely available. In fact, the magazine of my 9E was marked SR9. You can find extra magazines at ShopRuger.com at the full retail of $45, but I found them for only $35 at Brownells. The 9E's frame is a glass-reinforced nylon. It features a reversible rubber backstrap- one side of the backstrap features a flat side, the other curved to fill your hand a little more. Flipping it around is easy. Just push out the pin at the base of the grip, slide out the backstrap and reverse the process. The texturing on the grip is not very aggressive, but it does provide a non-slip surface. Ruger has long advertised the SR9 as having one of the slimmest grips of any double-stack 9mm on the market- 1.18 inches wide throughout most of the grip- and the 9E carries on that tradition. The 9E offers an ambidextrous magazine release and manual safety. The manual safety is positioned about where the thumb safety on a 1911 is and functions the same way- down for Fire. If you're used to firing with a thumb-high hold it is still possible with the Ruger, although the safety is a bit small and I'd hate to have to sweep it off with the side of my thumb under stress. The safety cannot be engaged unless the striker is cocked. The pistol also has a magazine disconnect safety. The trigger can still be pulled with the magazine removed, and the striker falls, but it won't make contact with the primer. Trigger pull on my sample was a little nicer than the SR9s I've shot, 5.5 pounds and crisp- well, at least as crisp as a striker-fired handgun's trigger pull can be. Because it's simply a variant of the SR9, the 9E is accompanied by an SR9 instruction manual with a one-page insert for the 9E detailing the parts that differ. That list is short: slide, sights and striker cover. I did not have an SR9 for comparison, but Trevino got me up to speed. "Astute gunsmiths will notice that we made a slight change to the striker cover," he said. "The new one does not have a separate disassembly hole. You just insert the tool into the striker hole. This allowed us to eliminate another spring and pin and is being implemented across the SR line as a whole." I have a lot of experience with the SR9, and way back in 2007 when I was just getting into the gun writing business, I was on Pat Sweeney's original crew tasked with torture-testing the very first SR9 any of us had ever seen. The seven of us put something like 7,000 rounds through that pistol over the course of an afternoon. We had about 11 magazines for the gun, so whoever wasn't shooting was loading. After about the third magazine it stopped being fun. The pistol got so hot that the flat back of the takedown pin, above the trigger guard on the left side of the gun, was too hot to touch. At one point, when the gun was already hot, Pat had me fire three full magazines through it as fast as I could pull the trigger and then another volunteer poured water down the barrel. Steam shot out of the gun. That was the only way we could get that early production SR9 to stop working- by steam-cleaning it. After Pat relubed the gun, it ran fine until we ran out of ammo- another 2,000 rounds or so. Internally, the 9E is identical to the SR9, and I didn't have the time, energy or ammo to put that many rounds through my sample 9E, but I did put about 200 rounds through it without a hitch. Being a full-size pistol chambered in 9mm, it was controllable and pointed naturally. The bore of the 9E is very low to the hand, so muzzle rise was not bad at all even during rapid fire. The 9E has benefited from the few tweaks to the SR9's design over the last few years. For example, the design of the safety on trigger has been changed twice. The SR9 is now a proven commodity, so because of that 9E buyers are experiencing added value. The 9E offers customers the same gun as the SR9- minus some minor cosmetic differences, one less magazine and a cardboard box instead of a molded case- for a reduction in suggested retail of $100. 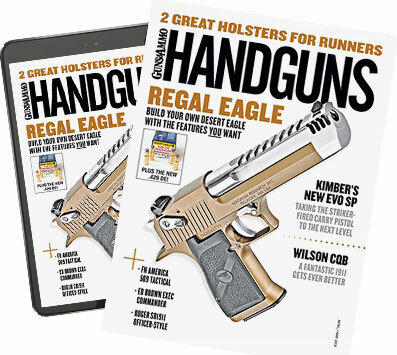 Ruger isn't the first company to do this- Kahr followed the same route with its C series of compact pistols- but it is the first of the high-capacity, duty-size 9mm pistols with a dedicated economy model. When I learned I was going to be reviewing the 9E, I assumed I would have to struggle to find enough things to say about a gun that is so familiar to everyone. But the truth is, I actually like the 9E more than the SR9. I like the slide profile with the flats a lot better than the SR9's rounded top. The 9E's wider slide serrations work just as well and, in my opinion, look nicer. I prefer the look of the sights- and the incrementally longer sight radius- to those found on the SR9. And then there's the lower price. I'm sure the street price on the 9E will be under $400, which is an amazing deal. Think about that: an American-made, full-size, full-featured, high-capacity 9mm from a major manufacturer selling near or under $400? That's a big deal.